Starting near the end of April 2011, I began to track every game I play (give or take a few, I’m sure) on Board Game Geek. And starting in January of 2012, I gave an overview of the games I played in the previous year, namely my “nickels and dimes” (games played 5+ and 10+ times, respectively). It’s time to continue that tradition. Here’s my list of nickels and dimes from 2012, along with some commentary and a comparison to my list from 2011. Note: Games marked in blue appeared on last year’s dimes list, and games marked in red appeared on last year’s nickels list. Before I discuss the details of the games themselves, I should talk about a few realities of the past year that have changed my gaming habits. First, my son was born in February, and he has required a lot of work from both my wife and me. As a result, I’m not able to host or make it to game nights as often as I used to, and game time at home has often been more low-key games. Especially right after my son was born, anything that required a lot of brain power was nixed immediately or just not brought up. My main gaming outlets are with my wife and over my lunch break at work, so any game that takes longer than an hour is much more of a chore to get going. The second reality is the growth of this website. @Futurewolfie did a good job presenting that here. Basically, our blog has exploded this past year (thank you, dear reader, for that! ), which has meant a lot more reviewing of new games. I looked over my plays on Board Game Geek, and I have played 100 unique games this year. Only 25 of those are represented on this nickel and dime list (though many of them were close to making the list). The third reality is that, as an outlet, I have played more games online against real opponents. I only count a game on my BGG list if it’s played against a real-life opponent (otherwise Dominion would be in the hundreds or thousands of plays, thanks to Androminion). Troyes, for example, was only played against online opponents (since finding face-to-face players was difficult). Okay, with those realities in mind, here is the commentary. Aside from the obvious trend that most games in my nickels and dimes weren’t on the list last year, the trend I notice in my dimes (10+ plays) for 2012 is that they fall into three categories: 1) games I play with my wife, 2) games I play with my lunch group, and 3) games I play by myself. There is some overlap here, especially with 7 Wonders and Dominion (coworkers and wife), but mostly the groups are divided. In the second category we have Glory to Rome, 7 Wonders, and Dominion. Glory to Rome I have played almost exclusively with my coworkers. I was uncertain at first whether this one would catch on (it’s tough to teach), but Glory to Rome is the ideal lunchtime game. It’s quick, offers good choices, is very interactive, and is just a ton of fun to play. 7 Wonders is the game of choice when we have a larger group (which is a more frequent occurrence, especially on Fridays). We sometimes mix in the expansions, but we mostly play just the base game. I’m amazed that after 50 or so total plays, 7 Wonders has remained fresh and still has options left to explore. Dominion is a perennial favorite. It’s easy to fit two (sometimes three) games in a lunch hour, and games are satisfying. And for solo games, we have Friday and the Lord of the Rings LCG. As you can see, I played a lot of the Lord of the Rings LCG in 2012, but the number of games can be misleading if you’re trying to think in terms of time. Many of those games I lost very quickly, and many of them ended short of the projected play time. I played this game exclusively solo. The game is very difficult solo, and after the almost fifty plays recorded in 2012, I decided it was too difficult solo. I don’t really have anyone willing or able to invest the time to learn this game and play with me, so I decided to trade it away at the beginning of this year. I’m a little sad about this, but only a little. Friday is a solo deck-building game that I really enjoyed. The problem with Friday is that, despite its small box, it takes up a lot of table space, so it’s not as portable as I would have liked. I like the game, but I ultimately decided to trade it, too. I won’t discuss all my nickels, but the same trends play out as in the dimes. Most of them are games I play with my wife, especially Canasta, Drop Site, Lost Cities, Roll through the Ages, Ticket to Ride Europe, Through the Desert, and Yspahan: all games I play almost exclusively with her. The rest, surprisingly, aren’t primarily lunch choices; they’re games I played mostly with family (especially Pandemic, Stone Age, and Money). Some surprises this year are that For Sale isn’t on the list. For Sale was my fourth most-played game last year (with eighteen plays), and it seemed poise to take this list by storm. Yet it didn’t even make the nickels? (According to my play count, I only played it twice in 2012.) My thought on this is that group playing situations fizzled this year through the disbanding of some church groups and more children in my and my wife’s families. (It’s harder to play games than it used to be.) I also blame myself on this one: I didn’t bring it to my family Christmas this year because I thought everyone already had a copy. This was a mistake. It was requested, and I couldn’t deliver. The Resistance, after its very strong showing in 2011, also did not make the 2012 list. In fact, I did not play a single game of this in 2012. I can point to a causal relationship here: I played the game with a player who was great at the game and also turned out to be lying about himself in real life. I realize that I should divorce the game from what happens outside it, but after this revelation, I didn’t have much desire to play it again. @Futurewolfie has convinced me, though, to try it again (in its Avalon incarnation), so we’ll see if this comes back in 2013. Another surprise is El Grande, which was only played once in 2012. ?!?!?! The reasoning here is, first, it takes more than an hour to play, and second, my gaming friends aren’t as keen on it as I am. Which is a terrible shame. I hope it sees more play this year. Ra almost made the list (at four plays). After the many plays we got in at the end of 2011, interest waned for this game. It saw a resurgence near the end of 2012, but not enough to make the list. So…my predictions for 2012 were a little off. Still, I am undeterred in making predictions for 2013. I predict that Dominion and 7 Wonders will remain–for a third year–on the dimes list. I predict that Glory to Rome will be a strong nickel but not quite a dime. Some games that I received near the end of 2012 will almost certainly make my 2013 list, most notably Chronicle, which I received in a math trade in December. My coworkers like this one, and so do I. I think the two-player games my wife and I love to play–Ticket to Ride, Lost Cities, Prolix–will end up on the dimes, with ones we like (but are longer)–Yspahan, Stone Age–on the nickel list. 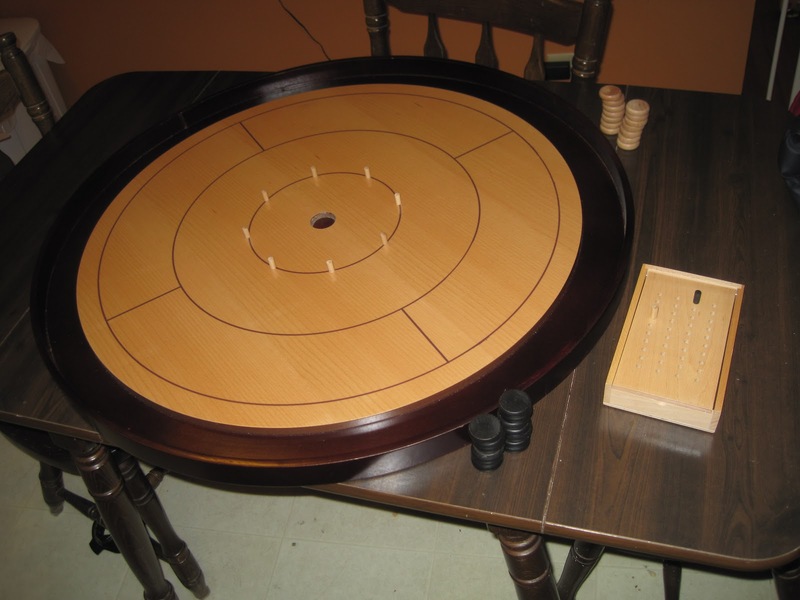 I expect Crokinole will be played less in 2013: we now have gates on the stairs and in our dining room, making transporting the board cumbersome; we’d play a lot more if it were set up all the time, but our son is much more mobile than he was. Games that are good cross-over fillers (FlowerFall, Incan Gold, Little Devils, and Escape) will see more plays in 2013. I think Saint Petersburg will make nickels again in 2013, but be lower down in the list. Tower of Babel was close to the nickel list in 2012. It might be a stretch, but this could make nickels in 2013. This is a game that my coworkers and I enjoy, but we’re not quite as enthusiastic as we are about 7 Wonders or Glory to Rome. I also got The Speicherstadt in trade at the start of this year (for Lord of the Rings, no less! ), which I predict will make the nickels list. My coworkers and I seemed to enjoy our first play. Qin will also almost certainly make the nickels, if not the dimes, list. It’s already close at four plays in 2013, and I anticipate there will be more as this is a quick, quick lunchtime game. Games I’m not optimistic about but would love it if I got to play them more in 2013 are Revolution!, Caylus: Magna Carta, Modern Art, Tournay, and Tigris & Euphrates. The first four are more possible than the last one (which won’t fit in a lunch hour). That’s my list for 2012. What does yours look like? What are your predictions for 2013?